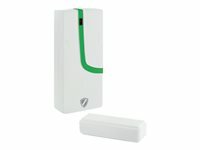 Additional product for the SCHWAIGER wireless alarm system "Green Guard"
This SCHWAIGER door and window sensor is used to secure windows, glass doors or sliding doors. If a door or window is opened without permission, a signal is sent to the center unit which then triggers an alarm in order to discourage intruders. The door and window sensor is an additional product for the SCHWAIGER wireless alarm system "Green Guard". The sensor only works in combination with a center unit (e.g. HG1000 or HG2000) and cannot be used individually.